I want to ask, How you imagine you perfect weddingd dress? For me securely needs have Lace and be like for a princess. I decided to share with yu two different dresses from this store that I really love it, and like always the lace is present. I love it see many different styles. I hope this post can be informative for you. Love these dresses, especially the first one! Very nice selection! These dresses are beautiful! It's very demure and princes-like! And I think my dress definitely has to have lace as well! These gowns look almost like fairy tale dresses! So soft and feminine and oh so romantic. Hi Sakuranko, Nice to see you here again and thanx for your comment. I haven't seen you around for quite some time. That is a unique quote. I've not seen it before. You're right, there really probably isn't any shade of blue that is exactly what any girl wants. I was hoping that he would get me something cheaper the next time if he wants to surprise me. Lol. Wow! This wedding dress is so pretty! 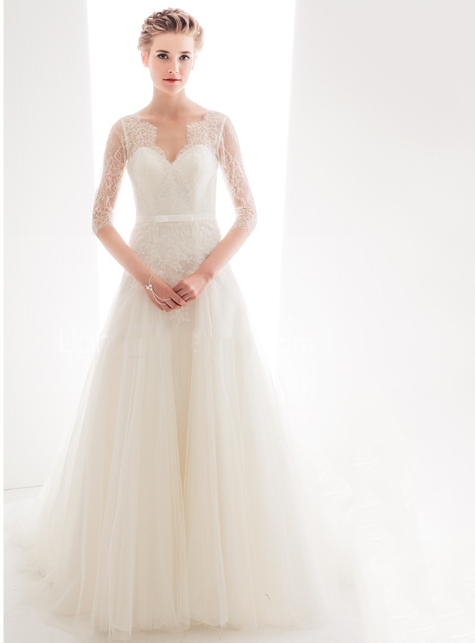 I think my ideal is a sweeping white wedding dress with a sweetheart neckline! I love lace dresses, and both of these are beautiful! The dress is so dreamy, what a stunning pick! Wow, the second dress is stunning, the lace detailing is gorgeous! Love the wedding dress. It is so elegant and pleasing to look at. These look very pretty and romantic! I adore that wedding dress at the top. It is feminine and gorgeous! For myself I have always envisioned a simple dress with a flared, tulle skirt. I don't need any sparkle or bling. These dresses look super awesome. I would love to try them and gift to my friends. Quite an interesting article! Recently I saw pretty lace wedding dresses in a wedding expo. Various wedding vendors participated in the event. Got many ideas for decorations at popular wedding venues in Los Angeles which we are thinking to book.